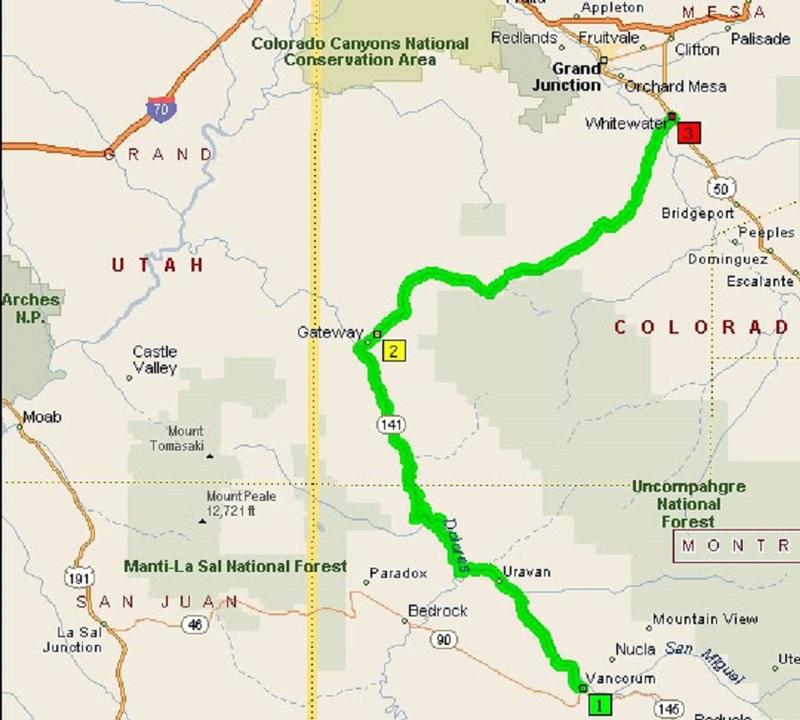 Roy and I traveled Route 141 on two different occasions in 2010; the first time in May via La Sal, Utah's Route 46 to Colorado's Route 90, and then up to Grand Junction. The second time was in October and we started at the beginning, well the beginning in our neck of the woods, Dove Creek. This is a wonderfully scenic drive; 3 to 5 hours depending on how much time you need to take photos and do some exploring; and yes, we took the 5 hour tour. The landscape throughout the trip changes constantly between desert, range, canyons of gorgeous sandstone, pasture, paralleling rivers, mountains, valley; it was difficult choosing a few photos from the hundreds once again. I'm going to give you the second trip, Dove Creek to Grand Junction, so you can have a good idea of what you do not want to miss out on. Once you make the turn onto Route 141 from Route 491, the landscape varies from pastures to range to desert; the road itself has twists and turns, small hills. Eventually the landscape turns more rocky and you will begin to climb upwards; at the highest point the La Sal Mountains are visible in the distance. Route 141 will be running parallel to the Dolores River, so lush oases of vegetation will be seen. All along Route 141 will be interesting sites to see from large formations, a painting on a sandstone wall, to smiling faces etched into rocks. Where exactly is every item? That's for you to find out; it wouldn't be an adventure if you knew at what inch or mile all the fun stuff was at. Seriously, I don't know about you, but knowing what to expect at every turn of the road sort of takes the fun out of the traveling experience. How can you not want to stop here for a laugh? Most travelers expect to see petroglyphs, and this is a form of rock art if you truly think about it. As you leave the Dolores River behind and begin paralleling the San Miguel River, the River Road will be hugging high and sheer sandstone walls. We also saw an oven built with stones. At a particular bend of the Dolores Canyon, remnants of the "Hanging Flume" can be seen from a pull-in area; built in the 1880's, the flume carried water to the mines. 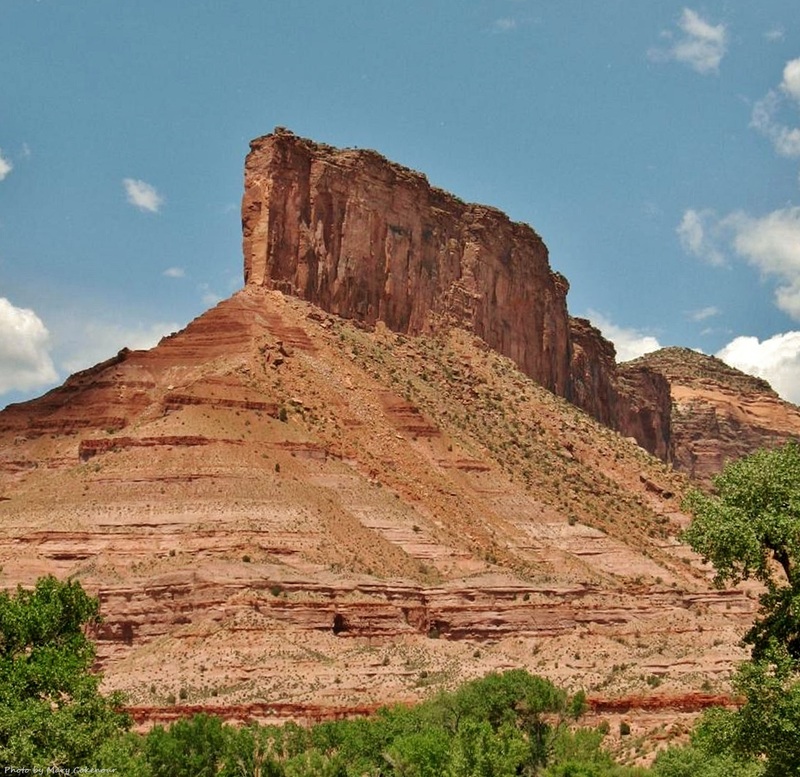 Between Naturita and Gateway, Route 141 is known as the ﻿﻿Unaweep Tabeguache Scenic Byway and you'll pick up the Dolores River once again. We stopped along the road to walk an ATV trail canopied by the trees; it was just one of those idyllic moments one cannot miss out on. Now prepare for a feast of sites as you are heading towards Gateway, Colorado. There is an arch at Thimble Rock also. Oh, I know I'm writing about our second trip which occurred in October of 2010, but I have to post this photo of a waterfall we found on the May trip. Snow was melting off the surrounding mountains and it was just an awesome site to see. Getting nearer to Gateway (not where the computers originated or are manufactured), the scenery is simply breathtaking! Overlooking the town is a pointed mesa called "The Palisade". 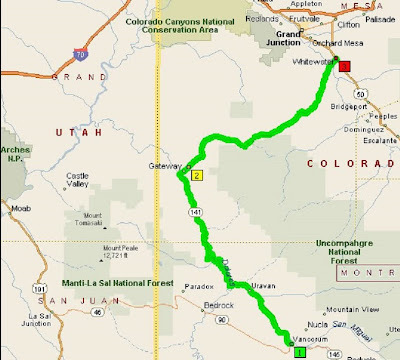 The trip along Route 141 will be ending soon enough as you begin to see the whitish landscape of Whitewater; merge onto Route 50 heading northward and then west to reach Interstate 70 and the city of Grand Junction. Now you get to pick one of the various restaurants to have a well deserved meal, and sneak peeks at the photos you've taken. As I mentioned earlier, when you're traveling around, especially on vacation, don't worry over how many inches, feet, miles are between each site to see...just enjoy the ride!